Predicting cryptocurrency prices is a fool’s game, yet this fool is about to try. The drivers of a single cryptocurrency’s value are currently too varied and vague to make assessments based on any one point. News is trending up on Bitcoin? Maybe there’s a hack or an API failure that is driving it down at the same time. Ethereum looking sluggish? Who knows: Maybe someone will build a new smarter DAO tomorrow that will draw in the big spenders. So how do you invest? Or, more correctly, on which currency should you bet? The key to understanding what to buy or sell and when to hold is to use the tools associated with assessing the value of open-source projects. This has been said again and again, but to understand the current crypto boom you have to go back to the quiet rise of Linux. Linux appeared on most radars during the dot-com bubble. At that time, if you wanted to set up a web server, you had to physically ship a Windows server or Sun Sparc Station to a server farm where it would do the hard work of delivering Pets.com HTML. At the same time, Linux, like a freight train running on a parallel path to Microsoft and Sun, would consistently allow developers to build one-off projects very quickly and easily using an OS and toolset that were improving daily. In comparison, then, the massive hardware and software expenditures associated with the status quo solution providers were deeply inefficient, and very quickly all of the tech giants that made their money on software now made their money on services or, like Sun, folded. From the acorn of Linux an open-source forest bloomed. But there was one clear problem: You couldn’t make money from open source. You could consult and you could sell products that used open-source components, but early builders built primarily for the betterment of humanity and not the betterment of their bank accounts. Cryptocurrencies have followed the Linux model almost exactly, but cryptocurrencies have cash value. Therefore, when you’re working on a crypto project you’re not doing it for the common good or for the joy of writing free software. You’re writing it with the expectation of a big payout. This, therefore, clouds the value judgements of many programmers. The same folks that brought you Python, PHP, Django and Node.js are back… and now they’re programming money. This year will be the year of great reckoning in the token sale and cryptocurrency space. While many companies have been able to get away with poor or unusable codebases, I doubt developers will let future companies get away with so much smoke and mirrors. It’s safe to say we can expect posts like this one detailing Storj’s anemic codebase to become the norm and, more importantly, that these commentaries will sink many so-called ICOs. Though massive, the money trough that is flowing from ICO to ICO is finite and at some point there will be greater scrutiny paid to incomplete work. What does this mean? It means to understand cryptocurrency you have to treat it like a startup. Does it have a good team? Does it have a good product? Does the product work? Would someone want to use it? It’s far too early to assess the value of cryptocurrency as a whole, but if we assume that tokens or coins will become the way computers pay each other in the future, this lets us hand wave away a lot of doubt. After all, not many people knew in 2000 that Apache was going to beat nearly every other web server in a crowded market or that Ubuntu instances would be so common that you’d spin them up and destroy them in an instant. The key to understanding cryptocurrency pricing is to ignore the froth, hype and FUD and instead focus on true utility. Do you think that some day your phone will pay another phone for, say, an in-game perk? Do you expect the credit card system to fold in the face of an Internet of Value? Do you expect that one day you’ll move through life splashing out small bits of value in order to make yourself more comfortable? Then by all means, buy and hold or speculate on things that you think will make your life better. If you don’t expect the Internet of Value to improve your life the way the TCP/IP internet did (or you do not understand enough to hold an opinion), then you’re probably not cut out for this. NASDAQ is always open, at least during banker’s hours. Still will us? Good, here are my predictions. Crypto is not a monetary investment in a real currency, but an investment in a pie-in-the-sky technofuture. That’s right: When you buy crypto you’re basically assuming that we’ll all be on the deck of the Starship Enterprise exchanging them like Galactic Credits one day. This is the only inevitable future for crypto bulls. While you can force crypto into various economic models and hope for the best, the entire platform is techno-utopianist and assumes all sorts of exciting and unlikely things will come to pass in the next few years. If you have spare cash lying around and you like Star Wars, then you’re golden. If you bought bitcoin on a credit card because your cousin told you to, then you’re probably going to have a bad time. Don’t trust anyone. There is no guarantee and, in addition to offering the disclaimer that this is not investment advice and that this is in no way an endorsement of any particular cryptocurrency or even the concept in general, we must understand that everything I write here could be wrong. In fact, everything ever written about crypto could be wrong, and anyone who is trying to sell you a token with exciting upside is almost certainly wrong. In short, everyone is wrong and everyone is out to get you, so be very, very careful. You might as well hold. If you bought when BTC was $18,000 you’d best just hold on. Right now you’re in Pascal’s Wager territory. Yes, maybe you’re angry at crypto for screwing you, but maybe you were just stupid and you got in too high and now you might as well keep believing because nothing is certain, or you can admit that you were a bit overeager and now you’re being punished for it but that there is some sort of bitcoin god out there watching over you. Ultimately you need to take a deep breath, agree that all of this is pretty freaking weird, and hold on. Now on with the assessments. Bitcoin – Expect a rise over the next year that will surpass the current low. Also expect bumps as the SEC and other federal agencies around the world begin regulating the buying and selling of cryptocurrencies in very real ways. Now that banks are in on the joke they’re going to want to reduce risk. Therefore, the bitcoin will become digital gold, a staid, boring and volatility proof safe haven for speculators. Although all but unusable as a real currency, it’s good enough for what we need it to do and we also can expect quantum computing hardware to change the face of the oldest and most familiar cryptocurrency. Ethereum – Ethereum could sustain another few thousand dollars on its price as long as Vitalik Buterin, the creator, doesn’t throw too much cold water on it. 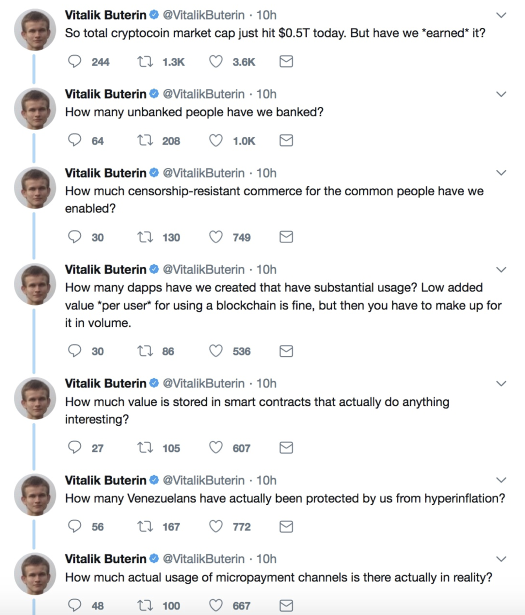 Like a remorseful Victor Frankenstein, Buterin tends to make amazing things and then denigrate them online, a sort of self-flagellation that is actually quite useful in a space full of froth and outright lies. Ethereum is the closest we’ve come to a useful cryptocurrency, but it is still the Raspberry Pi of distributed computing — it’s a useful and clever hack that makes it easy to experiment but no one has quite replaced the old systems with new distributed data stores or applications. In short, it’s a really exciting technology, but nobody knows what to do with it. Where will the price go? It will hover around $1,000 and possibly go as high as $1,500 this year, but this is a principled tech project and not a store of value. Altcoins – One of the signs of a bubble is when average people make statements like “I couldn’t afford a Bitcoin so I bought a Litecoin.” This is exactly what I’ve heard multiple times from multiple people and it’s akin to saying “I couldn’t buy hamburger so I bought a pound of sawdust instead. I think the kids will eat it, right?” Play at your own risk. Altcoins are a very useful low-risk play for many, and if you create an algorithm — say to sell when the asset hits a certain level — then you could make a nice profit. Further, most altcoins will not disappear overnight. I would honestly recommend playing with Ethereum instead of altcoins, but if you’re dead set on it, then by all means, enjoy. Tokens – This is where cryptocurrency gets interesting. Tokens require research, education and a deep understanding of technology to truly assess. Many of the tokens I’ve seen are true crapshoots and are used primarily as pump and dump vehicles. I won’t name names, but the rule of thumb is that if you’re buying a token on an open market then you’ve probably already missed out. The value of the token sale as of January 2018 is to allow crypto whales to turn a few cent per token investment into a 100X return. While many founders talk about the magic of their product and the power of their team, token sales are quite simply vehicles to turn 4 cents into 20 cents into a dollar. Multiply that by millions of tokens and you see the draw. The answer is simple: find a few projects you like and lurk in their message boards. Assess if the team is competent and figure out how to get in very, very early. Also expect your money to disappear into a rat hole in a few months or years. There are no sure things, and tokens are far too bleeding-edge a technology to assess sanely. You are reading this post because you are looking to maintain confirmation bias in a confusing space. That’s fine. I’ve spoken to enough crypto-heads to know that nobody knows anything right now and that collusion and dirty dealings are the rule of the day. Therefore, it’s up to folks like us to slowly buy surely begin to understand just what’s going on and, perhaps, profit from it. At the very least we’ll all get a new Linux of Value when we’re all done.